Hello and welcome to my blog! This post completes a series in which I’m building a pair of tall shoji in western red cedar. 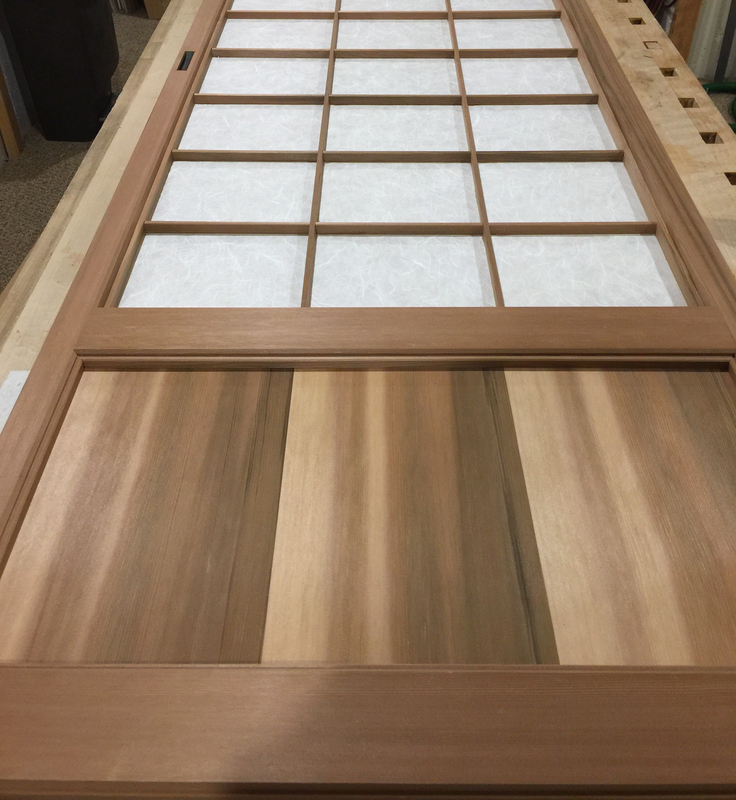 The previous post left off where I had been making arrangements to plane the kumiko for these doors. These doors, being exceptionally tall, have encouraged even more changes to the workshop. I have finally felt my bench as a shortcoming in the shop, later this year or early next year I may make a change to that and build a longer bench. Traditionally many use narrow and long benches for most woodworking, I will likely do the same so that I can work long stock without making special arrangements. Shoji, in their traditional form, provide three basic kumiko layouts; a standard layout (2/3 ratio horizontal rectangle), a dense horizontal layout or a dense vertical layout. Shoji making is very much standardized in traditional Japanese architecture. Standardization has allowed shoji to be made by someone who specializes in making shoji, known as tateguya, to a set of predetermined dimensions and kumiko layout. Kumiko is further specialized and many shokunin practice in making unique and incredibly detailed kumiko patterns beyond those three basic patterns. In utilizing shoji in contemporary western architecture some changes must be made to accommodate the needs of western users. The primary change, in this instance, is to the height of the shoji. Traditionally the shoji are 5.80 shaku, which translates to 5.76 feet and requires the user to bow as they pass through the opening. Along with a change in height the proportions must also change to accommodate the width of the door opening. In changing the proportions of height to width to accommodate the opening space where these shoji will be installed, a new pattern for the kumiko must also be determined. With kumiko slats in hand, I laid them into the frame until I found a pattern which satisfied my eye. Originally I approached the layout with a single center slat in mind, but ultimately decided to have two slats which divided the layout into three spaces across the width. The number of kumiko along the height was adjusted until I reached a suitable proportion for each rectangle space. I wanted to approach a similar proportion to that of the traditional layout without the layout becoming overwhelming due to the height being increased significantly. Once I established my layout, it was time to begin cutting kumiko to fit, starting with the interior frame known as tsukeko, then moving onto the horizontal and vertical kumiko shortly there-after. Once the kumiko were cut to size I could then plan out my joinery and begin cutting. I did not document the process of cutting out the kumiko, having done so recently in a post: Making Shoji and also I had an apprentice looking in on the process (my dad). My father, having built a business in metal working from the ground up, has been offering guidance and moral support as I progress with my own business. He was also interested to see how shoji is made. Once the kumiko was cut and assembled, the latticework was placed back into the frame and the interior frames thickness transferred to the kumiko. These marks are where the tenon shoulders will land. Here I am using a double square and knife to mark the shoulders. After the kumiko tenons were cut, the tsukeko was removed from the frame and then mortised to accommodate the aforementioned tenons. The kumiko could then be assembled as a whole and prepared for fitment into the shoji frames. Now that the kumiko was complete, it was time to turn my attention to the kick panels. I had enough western red cedar to saw six sequenced boards that would be utilized to create two panels. The panels were glued up and finish planed, then set aside to be marked and trimmed to height. The doors were ready to be glued up. I’ve been utilizing hide glue on my builds as of late, the reversible nature of it appeals to me and it is quite strong stuff that is far easier to clean up than PVA glues. Once that bottle of Titebond is used up I have a bottle of Old Brown Glue ready to go that I am excited to put to use. I set my winding sticks in place to ensure that the doors were assembled flat. One corner had to be shimmed up to compensate for the bench. Shoji doors are incredibly flexible, but it’s always best to start from a square foundation. The glued up door was now ready for final finish planing. A few strokes on the exterior surfaces to brighten up the wood and remove any shop wear. This shaving is looking exactly as one should for the final passes. It’s critical to have the final pass be of the full length, eliminating the appearance of stops and starts along the stile, which show especially poorly on softwoods. The mentori-ganna is used to apply uniform chamfers, which offer improved visual appearance on the stiles and strengthen the sides to prevent splintering. Next the panels are installed and the paper applied. Normally the panel would be simply fitted into a groove, however since the kumiko on these shoji featured a tsukeko, I thought it only appropriate to do the same for the panel. The paper has a silk strand worked into its pattern, the silk strand shows beautifully when the doors are backlit. I had on hand ebony pulls and my client requested that I apply them here, which I was happy to do. Now that the doors are complete, I turned my attention to the tracks. The tracks in this case would feature a single groove. The tracks were milled up from vertical grain cherry, which I processed by hand, then grooved with a router table. After grooving with a router table the track groove was cleaned up by a series of hand planes to ensure smooth travel. The doors and tracks were brought to the client’s home for installation, the upper track set into a space between the wall and ceiling and the lower track attached to the floor. The installation is complete in a functional form, but awaits more detailed moldings which will surround the door frame and tracks. A 1/2″ gap was left between the doors and wall which will accommodate the moldings, which I will make. The moldings will reduce that gap to a more appropriate 1/8″. I intend to use vertical grain cherry to frame out the door and track. Once the doors were set in place, they were leveled so that the door stiles met evenly. After which I took note of where they were contacting and once again planed the sides until they met exactly and contacting along their full length. Thank you for following along with this build, I hope you have enjoyed seeing this variation on an element of traditional Japanese architecture used to finish the interior of a mid century modern house. Beautiful work Brian! Thanks for sharing it. Hi Carey, It’s my pleasure, thank you for your comment. I am an old friend of your parents & wanted to say hello & compliment you on the stunning workmanship on these doors! Wow!! Really beautiful detail, great job! Hi Cathy, Thanks for your comment! Very much appreciated and I will tell my parents that I heard from you. The doors look great Brian. I bet they work smooth as silk. I really like the way you arranged the grain in the panels, very nice effect. The description is well presented too, as per your usual. Thanks Greg! Good to hear from you. They run very smoothly, it amazes me every time that wood on wood can operate so well. Also, now that I’m done with this set, I’ve just been dying to build another…this time possibly to spruce up the workshop. Thanks Gav! Much appreciated. I’m fairly careful in the workshop (not especially so, but I guess enough so) and I spent so much time in there that I feel it’s an improvement on my experience each time I improve the shop, wether it be small things or large. Brian My name is Chuck, “Chuckerbe” on instagram from W Hartford CT 56 y old father of four boys, husband, and woodworker. Just got the shoji blog it’s beautiful, a masterpiece. I just speak direct. A little background. I live in chronic pain(back pain T8) but get stuff done just on a much different timeframe months or years to get things done. I wanted to say your work is great and inspiring. I’ve been using Japanese hand tools for years, maybe eight. I’m working on a bench on bench and have three questions would you mind helping? It’s mostly built. If so I’ll send a separate email with pics. Best to you and your family. Chuckerb Ps dad was class 56 Princeton. Good to hear from you, especially so since I know your handle on instagram. Thanks for the kind words. I’m happy to help where I can, so I’ll look for your email. I think your father’s class is the same year as a mentor of mine, small world.